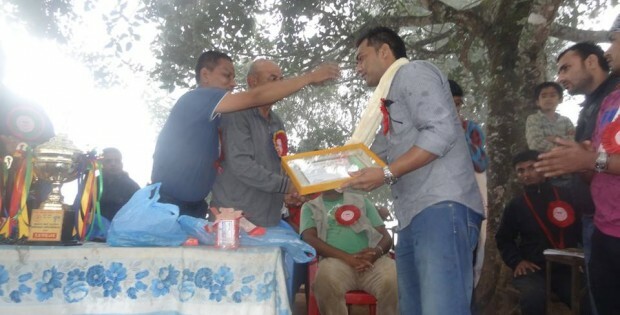 Managing Director of Above the Himalaya Trekking (p) Ltd during sport function at Dhola VDC. Social Contribution: Above the Himalaya Trekking has been involved in social welfare sector since our establishment. Besides trekking and Travel business we also believe in our responsibility towards our society. As employers’ actual social contributions are made for the benefit of their employees, their value is recorded as one of the components of compensation of employees together with wages and salaries in cash and in kind. A part of our profit goes directly to a local community. We try to develop activities such as home stay trekking programs, introduce new trekking routes in the country side, porter trainings, education etc. We always give something back to the areas where we are working, and are supporting schools, orphanage houses, recycle projects and help disabled people. We have open The Himalayan Library Sham Bhanjyang Higher Secondary School which is situated in Maidi VDC, which is 19 km west of Dhading District headquarter and about 108 km west of Kathmandu. The Shami Bhanjyang School is the apex public educational institution among of five VDCs namely Maidi, Dhola, Khari, Nalang and Salang which is meant to be densely populated in rural mid hill area. Dear all of our family and friends around the globe, we would like to inform you that all of our staffs at Above the Himalaya Trekking (owner, office staffs, trekking guide and porters) and their family and relatives are safe & sound from the devastating earthquake of 7.8-magnitude occurred in Nepal on Saturday April 25th. According to local media reports, number of buildings, historical landmarks in different parts of Nepal has been completely leveled with massive damage. We went to villages to see the situation and found the people now are safe but have bigger problems regarding shelter and food. We have provided some Tarpaulins but still there is huge demand. Many people are sleeping on the floors without Tarpaulin and food. Due to electricity cutout, even people who have food stuffs are unable to prepare it. We have visited the village second time and provide the 3000 kg rice and other support, Considering our responsibility, now we are working on to make few houses for the victims in need as a sustainable program. We are thankful that so many people are helping in the Kathmandu Valley. However, we are focused on more remote villages and mountains where there is much less support. We need to provide help for them with basic needs such as food, fuel, clean water, hygiene products, and most importantly the shelters. We are helping with food and tarpaulin as emergency support; however as said earlier our primary goal is to provide more help for the victims and provide them some support for disaster recovery and relief efforts in response to region of Nepal impacted by this earthquake. Thank you all of our friends, guest and great people for your great help. Together with the help of Mr and Mrs Jonen ABOVE THE HIMALAYA TREKKING has established a small school library called “The Himalayan Library” located in Maidi Ukhubari Dhading. The library is fully supported by Puru Timalsena, managing director of Above the Himalaya Trekking, and by Mr. Jim and Mrs. Carol Jonen, who are our honorary members from the U.S.A. Mrs. Val Riches from Australia has helped to edit the texts and is involved in many other social projects in Nepal as well Read More. We have been providing a scholarship for orphanage children of Dhola village, Dhading District and gave our help to 15 years old boy who lost his hand on the electric shock. Recently we have donated US$ 1255 for Shree Baraha Kalika Higher Secondary School at Dhola 3 Dhading to run their +2 programme. We have helped local club at Nayabazaar Kathmandu. Recently a woman from Dhola village, who stayed in Kathmandu burned herself to death due to poverty. We helped her husband complete the ritual funeral. We have been doing many other small helps for needy people in the village. We have participated for the ritual story telling event at Shami Bhanjyang Higher secondary school programme to raise fund for their graduation ceremony. We donated USD 2550 to the school. 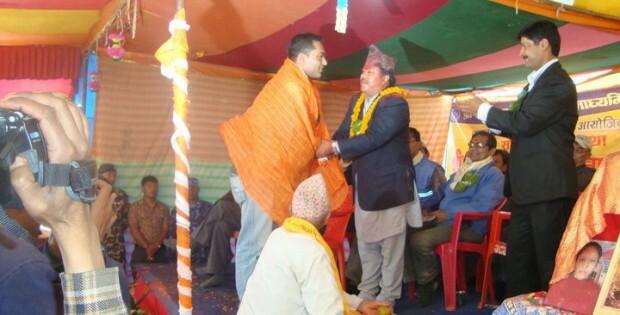 On the ceremony, Education minister Mr Gangalal Tuladhar was the chief guest. You can see our MD, Puru Timalsena being felicitated with him in the picture. 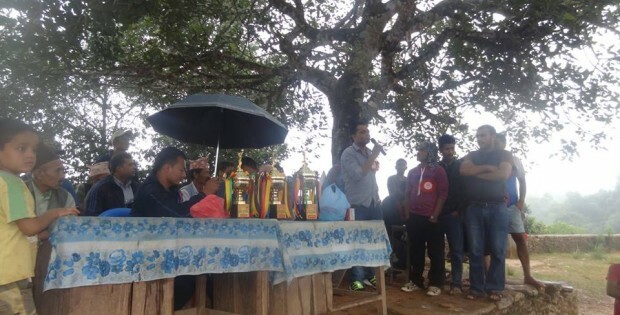 We have recently donated USD 400 to the local sports club of Dhola VDC, Dhola Sports Development Community for the Volleyball program which was held on October 11 to October 13, 2013. We also provided some sorts of regular helps and aids to the local communities. Our contributions to the society and the preservation of the nature have resulted in different kinds of letter of Appreciations and felicitations. The young leaders and social workers of Thulochaur Maidi, Dhading District, about 115 km drive from Kathmandu, started the campaign to open a computer study center for the village. As there was no computer institute there, the students and villagers needed to come to district head quarter or to Kathmandu for the computer education. We participated on the opening programme and donated USD 1077 to the center. We hope the study center will run in a very good way and the local people will get maximum benefit. Our help will continue for many other programmes and needy and poor people from local villages.